1} SCREEN HEIGHT: 1/2 distance to first row of seats. 2} SCREEN WIDTH: 1/6 distance to last row of seats. 3} BOTTOM OF SCREEN: 4' above the floor. 4} WIDTH OF SEATING: not wider than it's distance from the screen. 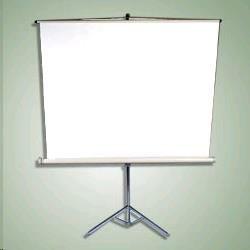 FOR SLIDE, OVERHEAD, AND OPAQUE PROJECTORS. ** Please call us for any questions on our screen 6 foot x6 foot 72 inch rentals in Fairview Heights IL.